Novartis Pharma filed Israel Patent Number 153229 titled “Use of 1-Hydroxy – 2 – (Imadazol-1-YL) Ethane – 1, 1 – Diphosphonic Acid in the Preparation of A Medicament for the Treatment of Conditions of Abnormally Increased Bone Turnover”. The Application was allowed and published for Opposition purposes on 24 July 2007, and Teva filed an opposition on 23 October 2007. After the Opposer filed their statement of case, the Applicant requested to correct the specification. The Opposer did not oppose the amendment, but following it, filed an amended statement of case. During 2011 and 2012 the opposition proceeded. On 10 April 2014 the applicant requested to amend the specification a second time. The amendment consisted of canceling claim 1 and dependent claims 2-5 and amending claims 6 and 7. The basis for the amendment was that the UK court had voided the corresponding patent, allegedly on formalistic and technical grounds, but to forward the discussion in Israel, the Applicant wanted to amend the specification by canceling these claims. Teva opposed the amendment, arguing laches and inequitable behavior since it was years since they’d filed their statement of case. They further claimed that the UK court had voided the patent due to the priority date and not on formalistic grounds. The UK Court of First Instance had issued their ruling over a year earlier, and this should be taken into account when considering the request to amend the application. This consideration was strengthened by the Opposition to Israel Patent 324844 Gradstan LTD vs Bristol Myers Squibb (6 March 1979). Furthermore, the request to amend the claims was not supported by an affidavit, and this was further grounds for refusing the request. Novartis counter-claimed that the Appeal to the UK Supreme Court had only issued on 10 July 2014 and therefore there were no laches or inequitable behavior. Furthermore, if an affidavit was required, the applicant would be happy to provide one. Teva countered that the flaws requiring correction were stated in the statement of case and Novartis should have corrected their application at the first opportunity which was over four years earlier. The main argument is whether there is a statute of limitations or laches for amending a specification after allowance and before grant. The Opposer cited a very old case from 1979 to argue that this couldn’t be allowed, whereas the applicant cited the more recent Opposition to IL 101537 Merck and Co. vs. Unipharm Inc. (30 April 2003). The Deputy Commissioner noted that she had ruled on the grounds for post allowance amendments under Sections 29, 65 and 66 f the Law in Reva vs. Astellas Pharma and in Rafael vs. Elta, both from May 2014. The ability to amend the claims provides an advantage to the applicant, but it also results in side skirmishes that hold up the issuance of the patent, to the advantage of the opposer and to the detriment of the applicant. In this instance, the request to amend the claims comes after the submission of evidence, at the stage of the hearing. However, this was justified by the UK ruling only now being made final. Nevertheless, the request could have been made some months ago and wasn’t. No explanation was given. Although the ongoing Opposition prevents a patent from issuing (and being enforceable), it also provides uncertainty to competitors and the awarding costs only partially mitigates this. The Gradstan case was exceptional in that five years had passed from when the applicant knew that the specification should be amended and, according to the then commissioner (Yoel Tsur?) the proposed amendment did not achieve its purpose. In Merck vs. Unipharm the then commissioner (presumably Dr Meir Noam) ruled that even where there is a delay, the applicant should be able to amend the specification unless there is inequitable behavior or the applicant had previously fought tooth and nail for the wider claim set. The Applicant’s reason for the delay (pending final ruling in the UK) is prima facie justification to wait until now. Hence, the delay is a matter of months, not four years and awarding costs is a fair way to compensate the Opposer. There is no argument that the amendment is one that narrows the scope of protection since claims 1-5 are canceled and claims 6 and 7 are also narrowed since they specify a range of doses for menopausal women and the amended ranges are within the original ranges. The amended claims are also both fully supported by the specification. As to the requirement for an affidavit, Ms Bracha ruled that this is required to support a factual matter about which there is some dispute. In this matter, that is not the case. Both sides agree when the original UK ruling was and when the Appeal ruling made it final. The requested amendment is allowed and will publish for third-party oppositions. Absent such oppositions, the Opposer may file a corrected statement of claims within one month. If he does not wish to correct the statement of claims, he should alert the patent office of this within that month, and a hearing will be scheduled to examine the evidence. 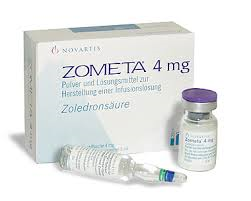 The active ingredient seems to be Zoledronic acid and the drug in question appears to be Zometa®. Refusing to allow a patent to be amended due to the request not being supported by an affidavit seems to me to be formalistic. I would not consider a problem with the priority date as merely formalistic though.